Lovely, light and airy, with breath taking views. This four bedroom, one bath and a extra half bath down stairs for day use (7am to 9pm), 1500 square foot home sleeps 10. This town house is all on the 2nd level. Two King, One Queen and One Full and a couch bed, high quality memory foam beds. A full kitchen has plenty of counter space, including a eating bar, the cook will never feel left out as it is open to the dining and living areas, and all the equipment you may need to prepare meals during your stay. Eat inside at the dining room table, that seats 6-8 or take your plates outside and enjoy your meal on the balcony, being constantly amazed how the mountains are at your doorstep. Too tired from a day of action packed activities to cook, take a leisurely walk down Main St. and enjoy one of the many quaint restaurants in the charming town of Joseph. Outstanding location, minutes from Wallowa Lake, and the Eagle Cap Wilderness area gateway to Hells Canyon and the Blue Mountains. This beautiful town house in the heart of Joseph is a perfect place to stay while you enjoy a fun filled vacation! With great amenities in both house and the community, may not ever want to leave! Smoke-free and pet-free home. Located 2nd level above Laundromat on the corner of Third and Main St. Entry to vacation rental is located on the south side with its own parking, separate from Main St activity. DISCOUNTS AVALIBLE, ASK WHEN REQUESTING QUOTE. here are some reasons we can give discounts, If you are just two to three people, last minute plans, need only two days, mid week, or off season. We Would Love To Work With You, if space is available, THANK YOU! Everyone who has ever stayed at Balcony View Joseph have absolutely LOVED it! Some guests who have stayed in the past at Wallowa Lake have said there is such a difference. Just being a couple miles from the lake, they comment about the AMAZING VIEW and being walking distance to everything in Joseph. Plus they like having cell and internet, which can be hard to come by at the Lake. We Love All the areas around the Wallowa County come SEE them and ENJOY for your self and be truly amazed in all it has to offer. Snowmobilers have plenty of parking access to Wallowa-Whitman National Forest with hundreds of groomed trails. Boaters also have parking for boats. Backcountry skiers will enjoy all the amenities to warm-up, rest-up and go back out to enjoy the Mountain. If your horse enthusiast we have a ranch just minutes away that we can care for your horses fully set up with stalls and paddocks. In living room, window air conditioner. Night are cool, we have fans in bedrooms. 3 out of the four rooms have window air conditioners in the summer. Warm base board Hydroponic Water heat.Slightly slow to heat, you have to be careful what you ask for, if you think setting it to high tempter will get it faster, not so, but will be slow to cool. Located down stairs in Laundromat. Yes we have internet and TV run on Smart TV through Internet. ONLY for inside please bring towels to go down to the lake. Also if you have a supper large party you may want to bring a couple extra towels. Large with Ice maker in bottom freezer. Double Oven one small upper and a full size lower. Seasonings, Olive Oil, Sugar, and condiments. In 3 rooms as well as in living room. This location worked out great for a short work trip and the view was amazing! Beautiful view! Lots of amenities! Large enough for a family! The location was great. Grandkids played with the toys and we all enjoyed a game of “Deer in the Headlights”. We baked birthday cupcakes and cooked up breakfast with a full kitchen. Thank you for the complimentary wine, cheese and crackers. We would recommend this rental and would stay again. I work in realestate. This is a nice place. Great kitchen. Hot water for ever. Best beds you'll sleep on. Very well supplied. Comfortly slept 8. 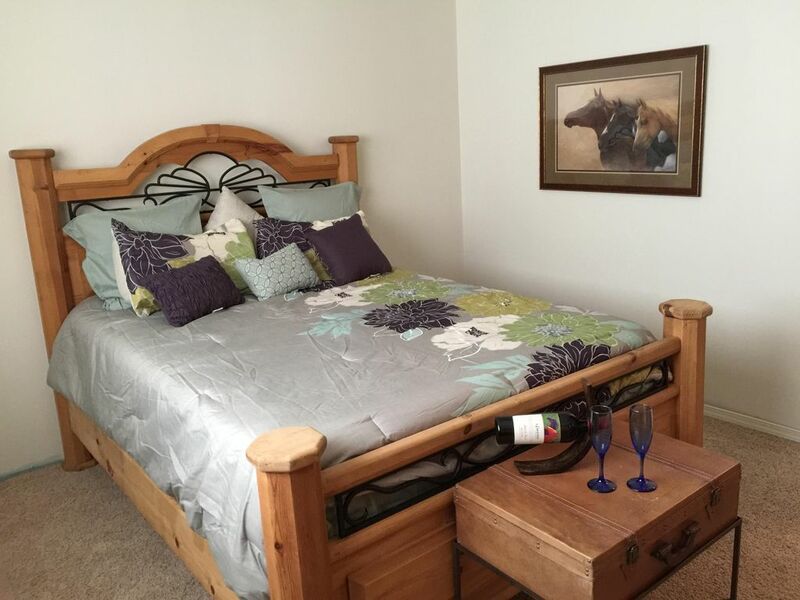 Clean, well-stocked, and centrally located in beautiful Joseph, OR. The Balcony View was our home away from home for Christmas 2018. What a special time for our family! The property was clean and well supplied with everything we needed. We love the Wallowa Valley and this was the perfect place for us. We never met our hosts, Craig and Kathleen, but they left balloons and wine for our daughter who celebrated her 21st birthday during our stay and were at the ready to help if needed. A beautiful Christmas tree and other lights and decorations made for the perfect Christmas for us. Loved everything about this condo, especially the great smells coming from the catering business below. Only one bathroom, altho they say there is another one below in the laundrymat. Everything was spotless and lots of good notes for reminders of additional things they offer, like linens, kids toys,etc. Love the views!! Easy check in and check out! We stayed four nights in September — a beautiful time of year to visit Joseph. Highlights include: Joseph Branch Railriders, kayaking Wallowa Lake, Jose's hospitality at La Laguna, and breakfast at Old Town Cafe. Kathleen's apartment was a great home base for our young family. The kitchen is well-stocked for cooking in, and there are more than enough toys to keep the kids occupied.